By way of intro, I knew I had an issue because I was doing some interim checks on my gas bottle mass to keep tabs on how quickly I was using it. Summary in the table below. 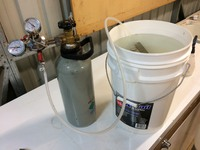 Keeping in mind that most of my kegs are reasonably carbonated when I transfer from my kegmenter, there was simply no way to explain the gas usage apart from a leak. Molar mass of CO2 is 44g/mol, so 44 x 0.573 = 25g to push 19 litres. But looking at the rates above, I would had to have been drinking ¾ of a keg per day on average over that period from April to December, which I simply wasn’t doing. 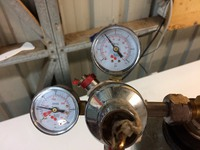 So leaving everything set up on my manifold, I turned up the pressure to 40 psi and then submerged everything, disconnects, manifold, and as much of the line as I could. I then looked for bubbles. What struck me was how subtle they were, this is not something you would pick up with star san. Some images are below, and I’ve uploaded a vid to youtube as well to try and show you. I identified a leak at a barb connection without a clamp, so that was an easy fix. I also noted that where I had previously kinked a gas line, there was a leak out of the line wall here. So I’ve removed that section. I had previously thought there was some leakage out of my disconnects themselves, but they actually looked pretty good. The most annoying one though is where the left hand valve threads into the body of the manifold. I’ve tried unscrewing this, but it’s in there very tight and I’m just damaging the valve. Once I work out how to remove this, I will thread tape it up and reinstall and re test. But even given the above, hopefully I’ve addressed most of the leaks that I could find, which should give me much more life from my bottles. I will post back later once I let it sit for a bit and get a good measurement. My brother said that these manifold taps are seated in hot glue. And that he used a heat-gun to get a tap (or end screw?) out. They're ball park similar because I don't know what parameters kev has used, but I can get similar results by tweaking serving pressure and temperature. The point is they seem to rely on similar principles, and a comparison to my actual usage over that time shows that I'm nowhere near either result. Edit: I'm just using the ideal gas law so I'm not sure if there's a better method than that. But it should be good enough from the dispense only side of things. My actual keg consumption during that period would have been more like 6 to 10 kegs. I didn't think that the barbs should be used without a clamp. 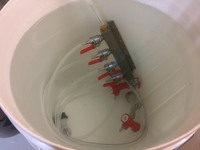 Even if they don't leak when assembled what happens when the line gets pulled around with use and the hardening of the line when it gets cold. For the small cost of the clamps I think it's a worthwhile investment, a couple of dollars for a few clamps or the $40-$50 for a refill. For the sealing of the thread I'd use a liquid sealant. pneutapper put me onto this stuff from bunnings. Because it's the gas side it doesn't have to be food grade. I did query it with the company and they mentioned that heat is the problem so not recommended on the liquid side of things. New keezer is definitely getting clamps. Just never bothered before because I was lazy. Yep, that's where I found at least 3 different manifolds leaking before I bought a slightly higher quality one which still needed one of those valves removed, cleaned, new thread sealant and assembled. Zero leaks now it is great. In terms of your calculations, they are sound and I suspect the variation to others is simply that you've use 69 bar as the cylinder pressure, but CO2 is liquefied under pressure at atmospheric temperatures. So it is like LPG but not like Nitrogen/Argon/Oxygen. Example right now the pressure in my CO2 cylinder is 55 bar. In Winter it's substantially lower. I haven't accounted for the high pressure side at all. All I did was the ideal gas formula, rearranged to solve for the number of mols that will occupy 19 litres at whatever temperature and pressure, and then used the molar mass of CO2 to calculate the number of grams of gas required, and divided that into the 4kg of gas I knew I had from that refill. I'm not sure the high pressure would even come into it? You’re right, sorry I misread the calc. My only other guess as to the variation would be perhaps the others used a formula for actual CO2 to account for compressibility etc, where as the ideal gas law is more fundamental than accurate. What brand is the manifold and where did you snaffle it from, looks different from other gas manifolds I’ve seen online. Not keen on having to piss about too much when I set my kegerator up so a better quality manifold etc is on the shopping list. 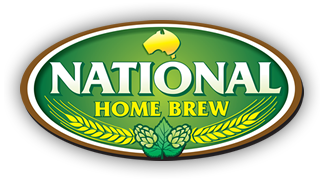 From National Homebrew, who is a site sponsor too, chat to Martin there he is super helpful, no affil just happy customer over the years. Just when I thought I had this nailed, I've noticed the pressure dropping on my 6kg cylinder already and wondered WTF? Was swapped recently and was 19.31kg when I hooked it up to my keezer on the 28th of January. Measured today it is 14.525kg, so it is leaking like a sieve. I know I have a small leak at one of the threads, but even with this leak the worst I observed last year was 50g/day gas usage. 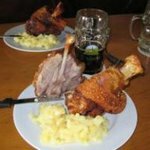 This is now 230g per day. My next suspicion is some disconnects, I've noticed a few are very temperamental when bumped, and have to be dead straight to seal. 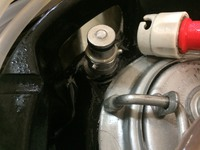 These are CMB pin lock disconnects. I highlight pin lock because these do not seem to be available in stainless from what I've seen. I have swapped around and am sure it's an issue in the disconnect rather than the post, because the good disconnects are good on all posts, and the bad disconnects are bad on all posts. I will cease using those 2 disconnects, but anyone had any luck with a refurb or using a fatter seal on the post to take up the difference? They are just black, not sure of material. Would have been the ones that come in the standard seal replacement kit you buy when you get 2nd hand kegs. Thanks for that. The video is good too. I had something like 35 kegs from my 6kg bottle, which is close but 10 kegs short with carb and dispense. Surely I don't use that much cleaning? I'll have to do a leak test too. 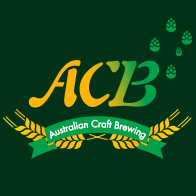 All hail the ACB Garden Gnome!!!! I've had trouble with those over the years. Silicone is a bit more durable and less stiff so it forms in nicely to the disconnect grooves. I've pasted the universal o-ring sizes and which match standard keg seals below. If you have a spray bottle of starsan, spray all connections, at 250g/day I'd reckon that should be quite visible with starsan spray. 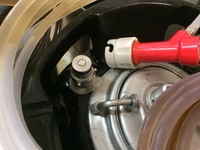 Keg lids and especially the pressure relief valves are usual culprits. I have tried with star san and no issues, but will try dishwashing liquid as well. I'm 99% sure it's the disconnects. I've taken the two culprits off, and will observe the gas usage throughout the week and see if that's nailed it. If not, I've seen people using the orange silicone ones on the posts so I will look into those, and if that doesn't solve it I will do a full strip and rebuild..... again. i had a MKOL gas bottle leaking from the stem / valve where the bit you turn goes into the bottle. I'm not following you, can you post a pic of what you mean? So good and bad news. Decided to try and repair the tap I knew was leaking. Managed to get it off this time by holding it in my vise with timber packers, and carefully undoing that tap. I got it off without ruining all the brass. These look to be 1/4 " NPT fittings, and the spanner/socket size you need is a 5/8" (at least for my manifold it is). Cleaned it all up, applied 2 turns of thread tape and put it back in tight. In re-doing the bucket test though, I noticed while the newly serviced tap was fine, a previously undetected leak had developed in another tap, both out the barb connection and the thread itself. Managed to get this one off, but in doing so the barb unscrewed from the tap. So far so good, but in putting it all back together, I stripped the thread on the barb where it screws back into the valve, and the valve relies on this being there to seal. So I've taken the whole valve out and replaced it with an old brass spunding valve that I had to plug the gap, screwed up tight. I will order a new valve or two to replace it. I might have a 4 way manifold you can salvage parts off. At least 1 or 2 of the valves leaked but maybe one or two could be ok. Damn, in a fit of frustration I went and ordered two valves already. Thanks though. Found another culprit, a leak on the liquid side of the keg. I think this is structural though, seems to be coming out from under the rubber, rather than just the post. This only just started recently though, but I think I've lost beer out of this keg before, so it comes and goes. Might be time to retire this keg. Good to find it but not good about keg! Are you sure it’s not the seal on the dip tube? I'm actually not, I spent some time removing the rubber from around it, and am now doing another leak test on it. No leaks at all. So it could have just been the dip tube o ring sitting funny.